I received today's beautiful card as a swap in Fort Worth last weekend. M Thatcher was the creator and this lovely card was created using the Flirty Flowers Stamp Set. She chose the Powder Pink Fresh Florals Designer Series Paper, Powder Pink Ink and Cardstock to bring this card to life. I love the simple elegance of this card as sometimes subtle is what is needed. Now let's talk about the Color Revamp that has everyone so excited, including me. It's out with the old and in with the new. I've shared the colors that are retiring earlier in the week and if you missed that post you can CLICK HERE to be taken to it. 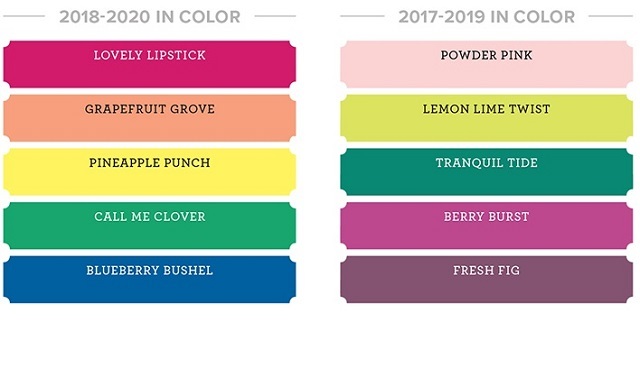 Drum roll please........ feast your eyes on the colors below that will be joining our collections, I absolutely love them!! In addition to the colors below the current In-Color Flirty Flamingo will be joining a collection as well. I hope you're smiling as big as I am, and I bet those creative juices are already flowing. If you have purchased through my On-Line Store in the last 12 months you will automatically receive a complimentary copy of the new catalog from me when they are shipped. If not, it's not to late place any size order through my On-Line Store before April 25th and you will be added to my list and remember to use the Hostess Code below for all orders over $30 to receive my April Customer Appreciation PDF. Happy Crafting!!! !